There’s nothing quite as comforting as a slow cooked braise with mashed potatoes. And you can’t beat the fact that they’re often a one-pot meal. My fallback meats for slow braises are pork shoulders and beef chuck. This recipe has been on my to-do list for a while: braised short ribs. 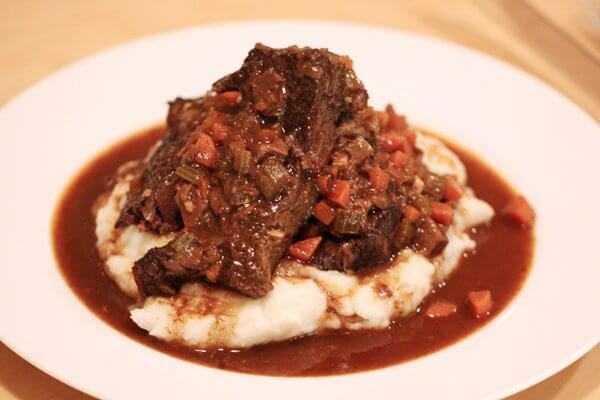 The recipe I made is one of the suggested combinations from Fine Cooking’s create your own braised short ribs recipe. Called “hunter’s style,” it uses red wine, chicken broth and mushroom soaking liquid as braising liquids, along with a combination of mushrooms, carrots, celery, onions, tomato paste, herbs and spices. There are 2 main style of butchering short ribs: English-style and flanken-style. The English-style ribs called for in this recipe, are individual ribs, a few inches long. When cooked, the meat shrinks around the bone but generally stays on. Flanken-style short ribs are cut across the bone, so you get strips of meat each with a handful of short bone segments. The meat is the same, but since it’s not wrapped around the bone, the bones will completely separate from flanken-style ribs during cooking. This makes for simpler hands-free eating, but the presentation is arguably less rustic. (You don’t know you’re eating ribs.) Where possible, go with English-style ribs. But I used flanken-style, and I was perfectly happy.